When it comes to working on your car , having the right tools for work cannot be over emphasized. Using inadequate tools can cause more problems than you expect. Floor Jack for example, is one of the most frequently involved tool in accidents especially in cases where the product does not live up to its safety claims. Floor jacks are very important and could be life threatening when they fail. The best floor jack is Powerzone 380044 which is heavy duty jack with the capacity to lift load up to 3 tons. It comes with safety features to prevent against overloading beyond its carrying capacity. The Powerzone 380044 floor jack is made of lightweight aluminum frame and a heavy duty steel lift arm which makes it very strong and durable. With such strength, this 59-pound piece of equipment can support load of up to 6000 pounds or 3 tons in a lifting range of 4 inches to 18.25 inches. It features a quick lifting hydraulic system which as the name implies, helps save time. This jack is also equipped with safety measures such as the safety valve which helps prevent overloading beyond its carrying capacity. While lifting the vehicle, the rubber padding at the saddle helps protect the frame of the vehicle from denting. The split padded handle helps you to generate enough leverage to lift any vehicle within its capacity and still allows the jack to be extremely easy to stow when it’s not in use. 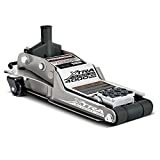 Other amazing features of the Powerzone floor jack are the front casters which are fixed and bidirectional as well as the rear casters which swivel for easy movement and positioning over rough surfaces. Apart from the impressive features, its craftsmanship makes it quite easy to operate so that you don’t have to share the weight of the jack while it is in use. It basically has all the features to be the best floor jack on the market, but even at a more affordable price. The Arcan Aluminum floor jack has its lifting capacity rated at 3 tons while only weighing 56 pounds. For vehicles within this range , it can go from as low as 3.75 inches to 19.4 inches’ high using its dual pump pistons for fast rising action. To prevent this piston pump from hydraulic contamination and reduced efficiency, the Arcan has piston dust shields. The shields protect all the liquids responsible for easy lifting and movement from contact with dust and rust catalysts. The ball bearing mounted rear swivel caster wheels as well as the wide track front wheels are in place for stability while the jack is under pressure for both efficiency and safety reasons. This combination also provides easy maneuverability during movement. The lift arm of the Arcan floor jack is reinforced for additional strength as well as a regulated torsion control and durability of the chassis. This arm has a saddle pad right on top at the point of contact with the vehicle which behaves like a cushion to prevent the frame and other components of the vehicle from dent during lifts. Unlike some other equally priced jacks, this floor jack has bypass and overload valves to prevent the hydraulic arm from overextending beyond its capacity as well as the entire jack from carrying loads beyond its stated capacity, which in this case is 6000 pounds. 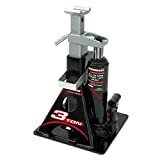 The major selling point of the Torin Hydraulic Trolley floor jack is its cost effectiveness. Compared to other floor jacks in its category, it is the most affordable. This impressively built sturdy jack accommodates the weight of trucks and SUVs up to 3 tons and can lift them to a height range of 6 to 21 inches. This is possible when paired with the extension adapter featured in this unit. The combined effect of the extension adapters with the extra-long neck helps save time and makes the entire lifting process easier. The equipment itself weighs about 44 pounds of aluminum metal. Given this weight, it’s tedious to move around on concrete floors which is why it is recommended by the manufacturer to be used on very flat surfaced floors. In addition to that precaution, the 360-degree swivel casters also aid mobility on the recommended flat surface. One feature that seems to get users confused is the position of the valve to let out air, which is the same used to add jack oil. It is located on top of the jacks’ canister. The valve is a red rubber grommet whose painting job makes it look like a metal and would discourage you from thinking that it is removable. However, all you need do is to pop flat head screwdriver under the opening and it opens. While some of these features happen to provoke a tedious usage method, this Torin Jack is one of the most affordable in its category and does a good job given its price range. The Powerbuilt 620479E floor jack is a beefy construction which ensures that you enjoy years of trouble-free service as it meets the ASME standards of durability, strength and versatility. It works without the need for any jack stand. All you need do is to make sure that the load is within the factory approved limit which in this case is 2 tons or 4000 pounds, then slide the steel safety bar under the lift arm to key it into a specific height. The height range for the Powerbuilt 620479E is 2.75 to 15.25 inches which is both low enough or high enough for most vehicle types. It is great for unibody vehicles in whose cases the positioning of the jack seems to be very difficult. The design of this jack allows it to be easily movable to different parts of the garage especially on very flat surfaces without needing to lift the 60-pound equipment up. It features a rubber and foam padding on the contact point of the jack to prevent the lifting process from damaging the frames of the vehicle. Therefore, all the safety aspects such as keeping the jack steady at any height within the height range, and also ensuring that the frame of the vehicle is not damaged during the lifting process are fully covered in this masterpiece. The only downside is that it is quite expensive compared to other products reviewed thus, and there have been multiple complaints about the packaging. Powerbuilt consider their tools to be the best and millions of users around the globe have attested to that. The brand aims to make users confident that their tools always meet or exceed the applicable standards set by the American National Standards Institute (ANSI) and the United States Government. This 6000-pound capacity floor jack features a patented design that combines the bottle jack and the jack stand design into one unit. Apparently this combination conveniently lifts two tons of weight conveniently to a height range of 11 to 21 inches. For this reason, it is perfect for SUVs, construction jobs, floor joist work, framing jobs and off-road vehicle repairs. With this wide range of applications, it can be used in virtually all weight lifting and mechanical situations. It doesn’t require jack stands as the safety bar locks the unit at any desired height within the lifting range. The jack is also equipped with a wide steel base which helps give stability to the load while it’s in an elevated position. This is an important safety measure because for more sensitive jobs, getting the vehicle to a particular height is not the major challenge. Keeping it at that height, firm and steady while you work is just as important and the Powerbuilt 640912 is capable of doing just that. The ground clearance of the vehicle you plan on using the jack for is very important especially if you are buying it for personal reasons, Otherwise, it’s expected of occupational mechanics to have different jacks for different vehicle height and weight capacities. For example, bottle jacks cannot work for lowered vehicles because the resting height alone is quite high. It would be completely ridiculous to have to dig the ground beneath the vehicle or drive the vehicle to a higher ground level before you can be able to use a jack. Therefore, for vehicles such as sport cars and other low cars, the hydraulic floor jacks are the best options since most of them happen to be low profile jacks. You should compare height dimension provided in the product details on the merchant website and compare it to the ground clearance of your vehicle before making a purchase. Cars are quite heavy. So, using a jack that has a lower capacity would destroy it or in the case of jacks with tension control valves or safety levers, it won’t even work. Therefore, find out the weight of your vehicle and then compare that weight to the capacity of the jack you intend to buy. The most common ones on the market have a capacity of 2 to 3 tons or 4000 to 6000 pounds. These types however, are ideal for small and mid-sized cars. Considering the fact that the jack is going to be lifting vehicles that are far heavier than it is, it’s best to ensure that its build quality either aligns or exceeds the ASME standards. You need to check the quality of material used in the manufacture of the jack and its components. The most common material used on the market is aluminum with steel parts. This is quite okay for small and mid-sized cars. You’ll need something stronger for bigger vehicles such as heavy duty steel, heavy duty aluminum or aircraft-grade aluminum (which is mostly used in hydraulic jacks) unless you plan on using two or more jacks in tandem. The aircraft-grade aluminum jacks are the strongest and the most durable. This is a very essential consideration because poor quality jacks could break while in use and cause serious injuries to unsuspecting users. More importantly, it’s best to buy a floor jack whose capacity fairly exceeds that of the vehicle in consideration for safety and efficiency reasons. EXTRA : Having the best floor jack is one piece of the puzzle. You should also consider investing in a high-quality torque wrench to help tighten those nuts underneath the vehicle. 5w20 vs 10w30 – Which Of Them Is The Best Of Your Car?